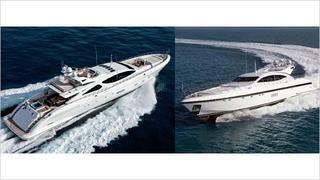 Overmarine announces a good beginning for 2013 with two new orders: one for a Mangusta 165 and one for a Mangusta 108. The Mangusta 165 is the 9th of the series. This sale happens just a few months after the sale of the 8th one, and make this 49.9m composite maxi open yacht series a real success only six years after her launch. The 33.5m Mangusta 108 is another success at the Italian yard. This one will be the 30th of the series, and will differ slightly from her sisters with the presence of new sundeck with a private solarium. The modern interior, designed by the in-house team with the owner, will accommodate eight guests in four cabins including a full-beam master suite. The Mangusta 165/9 will be delivered in 2014, while the Mangusta 108/30 is already scheduled for this summer.